Standard sized Euro containers will fit onto this tray trolley, enabling them to be moved around a warehouse or stock room and be filled up. The trolley will house a total of six of the 600mm x 400mm boxes, with the top two levels able to tilt either way to aid access. 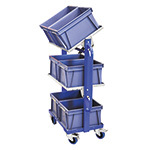 If you are using Euro stacking boxes for order picking, then this trolley is an idea way to make it easier to pack multiple orders at a time.